The Canada Ball Hockey League held a Hockey Day event for local children Saturday. Elementary school children from local schools including Chadwick International School and CBIS took part in the event, which included basic skills training and hockey games. 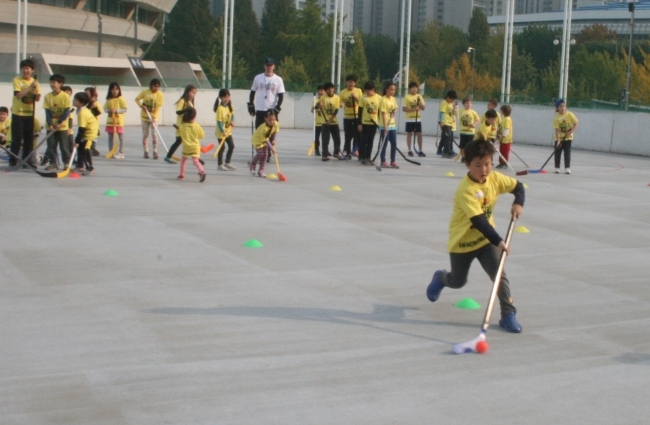 It was held to promote ball hockey and ice hockey among children in Korea and also to raise money for the Oak Tree Project, a nonprofit organization supporting higher education for orphans here. Sarah Murray, coach of the Korean national women’s ice hockey team, attended with nine national team players to help out with the coaching. “The kids look like they are having a good time. For a lot of them it looks like the first time they have held a stick,” she said. She added that she was keen to do more outreach in schools with her team. Canadian Ambassador Eric Walsh spoke at the opening of the event about the enthusiasm for hockey that Canadians including himself have, mentioning that he was looking forward to the Winter Olympics in Korea in 2018. “The coaches of the (Korean) men’s and women’s national teams are both Canadians and we are so grateful to have (Murray) here today and bringing some of your players to help extend some of the passion that exists around the world for hockey and also inspire some of these young kids to make it their sport of preference,” he said. Walsh added that he hoped that the event would not only raise awareness about hockey in Korea but also help the Oak Tree Project. CBHK made a donation of 1.08 million won ($930) to the Oak Tree Project later on in the event. CBHK is now in its 10th year and has grown to become one of the largest expat-run sports leagues in the country, with 10 teams and 130 players from Korea and abroad.